I was asked by a magazine to break up this outfit for a polka dot story for spring. It's actually something I've been meaning to do for a long time. I wanted to show how you can create multiple looks out of two identical pieces or twinsies. Working such a concept could even save you a dollar or two. I worked with the JIBRI twinsy, but I've seen duos at Asos & Walmart (Alexis Taylor Collection) as well. One thing I haven't seen is the intense peplum length on any other brand, but JIBRI. It's awesomeness. There are probably a thousand and one different combos you can work. Everything I used was in my closet and really easy to add into the polka dots. Note the shoes worn in this photo were pre-Shug (pro-nounced like Suge Knight) bad dog moment. Due to my leaving my shoes on the floor, she decided to chew one of them up. 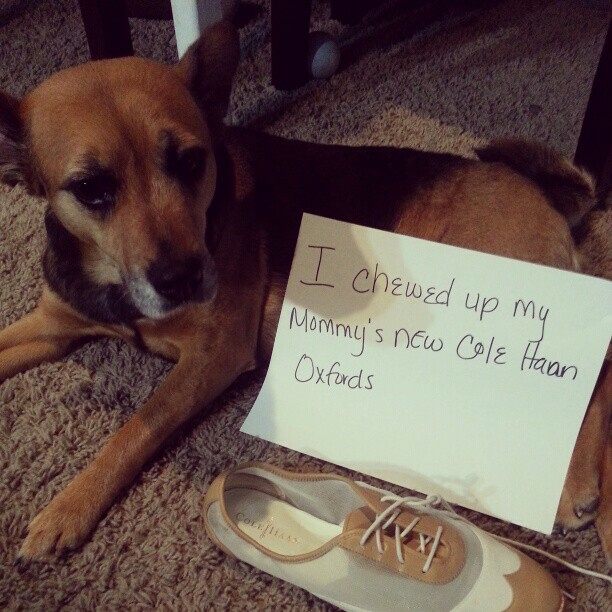 If you follow me on Instagram (@garnerstyle) you might have already seen Shug's dog shaming. I love every look you created! Fabulous! Love all the looks. Definitely gonna try a few. Wahoo Chastity! You look amazing!! 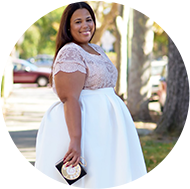 OMG, I soooooooooooo love that polka dot skirt! That is BEYOND amazing. Fantastic job pairing it. You looked gorgeous! It's a thousand pieces in one. I can't wait to try the looks myself. Maybe some print mixing too. Love the ideas, thanks! every one of them is amazing! Everyone has already commented on how aesome the outfits are, just wanted to add -loving your hair at the moment! Thank you!!! I just did a quick flat iron and added in my clip on bangs. wonderful combos! im loving them all! didnt actually know that polka dots could be that versatile! OMG...that little shameful face. I love all of the looks you put together esepcially the one with the tee and jean shirt. I love that the most because i can see myself wearing it haha. So sorry to hear about your shoes though. I have a cat that will ruin shoes in a heartbeat if he doesn't get his way. All these styles are cute on you. I love how you styled your hair too! Polka dots are a girls best friend. Hi! I am a lovely plus sized woman like yourself ;) but I am now pregnant and of course I still want to be fashionable with my bump...if I can find stretch clothing in plus size they should still be pregnant and pretty material right? I love peas! They have a deliciously retro side. I prefer all worn separately. Wow. You turned one outfit into a whole wardrobe. Love it . That is a great outfits. you go gurl show wat got. We need more of this cuz im a plus size woman but I love every bit of me . But we thick woman can do the same thing wat skinny woman do. You go gurl you look amazing. ..